La’Angum Learning Center began the 2016-17 school year in September. Executive Director Alice Iddi-Gubbels provided a list of what she hoped to accomplish between now and July. Continued teacher training and support in Montessori education: Two 3-day workshops with Mr Eric Gumah from Bawku, Ghana. Continued support for two teachers to complete their North American Montessori Center/Faith Montessori Diploma course. Initiate a lending library for students. Follow up and support with our graduates who are junior high school students at Unity Junior High School in Langbinsi. Outcomes assessment for grades 3 & 6. Hepatitis B screening, followed by vaccination and treatment of infected students. This is a very important health project to continue with our new Pre-k and transfer students. This includes administering booster shots a year after the initial inoculation, to provide for a 10-year protection. 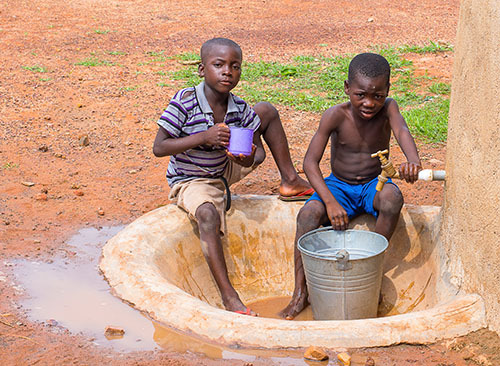 Continue to raise funds for expanded water resources and improved sanitation. Complete Montessori demonstration classroom. This will be an important practical support for teachers and students alike. Increasing friend and fund raising, in Ghana. Continue to provide funding and support for LLC, its facilities, operations, students and teachers. Diversify and expand funding sources by focusing on grants, donor development and friend raising opportunities. Help populate LLC’s new lending library with donated books. Expand and refine social media presence. Expand Global Market hours. This year it will remain open until 7:00 pm on Thursdays. The Global Market will open November 3 and close December 24.